As anyone with a passing knowledge of the life (lives?) of Bob Dylan knows, in late 1978, the singer-songwriter had a born again experience, and devoted the next few years to writing and performing (mostly) gospel material. But let’s not talk about Jesus just yet. Let’s talk about the incredible band Dylan assembled to take his new music to the people during this period – a group of stellar musicians who are finally given their due on the latest edition of the always essential Bootleg Series, Trouble No More. Those who splurge on the deluxe edition of the set will have the chance to bask in six discs of choice live recordings from the Gospel-era band (the more affordable two-disc set cherrypicks highlights), alongside two additional discs of previously unreleased studio, demo and rehearsal tapes. The all-star rhythm section of Jim Keltner and Tim Drummond provides the beating heart here – a firm but flexible groove that at times is as swampy and sleazy as the funkiest southern R&B and at others Sunday morning service-ready. The soulful twin keyboards of Spooner Oldham (later replaced by Willie Smith) and Terry Young add to the tent revival feel, and Fred Tackett’s sterling guitar work is a pleasure throughout. And of course, the troupe of background singers (including Clydie King, Gwen Evans, Mary Elizabeth Bridges, Regina McCrary and Mona Lisa Young) add the perfect blend of grit and polish. In short, this band smokes, and deserves to be mentioned in any discussion of Dylan’s greatest backing groups. Bob himself responds to his group’s passionate and precise attack with some of the most powerful and open-hearted performances of his career. 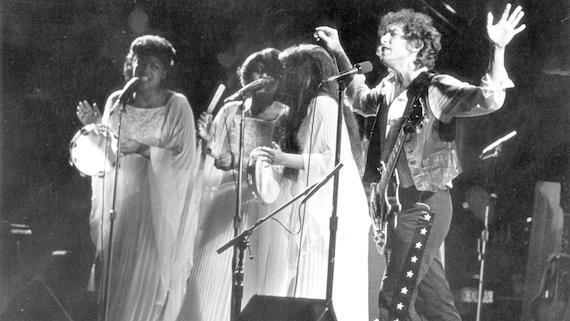 In 1979 and much of 1980, Dylan was presenting an entirely new repertoire to live audiences – he didn’t have “Like A Rolling Stone” or “All Along The Watchtower” to fall back on for an easy standing ovation (older songs would slip into the set in late ’80 and ’81). During those early shows, he really has to sell these songs to crowds that are often pretty skeptical about their hero’s newfound love of the Lord. So throughout Trouble No More, we get some dazzling Dylan vocal gymnastics, whether he’s spitting fire on “Gotta Serve Somebody” and “When You Gonna Wake Up” or reaching astonishing heights on deeply felt renditions of “I Believe In You” and “Pressing On.” The highlights are too many to note here, but suffice to say, Dylan delivers the goods, time and time again. The only misstep on the part of the compilers here is to leave out Dylan’s fire-and-brimstone sermons from ’79 and ’80, which may turn non-believers off, but possess their own very Dylan-esque music. Oh well, there are always the bootlegs. Trouble No More‘s studio discs are packed with delights as well. There’s a gorgeous, previously un-bootlegged version of “Caribbean Wind” featuring longtime Neil Young cohort Ben Keith on pedal steel. There’s a slow-burn unreleased song “Making A Liar Out Of Me,” with some the era’s most stinging lyrics. Maybe best of all is the sublime rehearsal recording of “Every Grain of Sand” that brings disc four to a fitting close. great write up. looking forward to diving in! I bought the vinyl version, and I have to say, I’m really happy with it. I always loved the “Shot of Love” album, and the review is right on, you don’t need to be a Bible thumper to enjoy this. The Great Betrayer finds a new turn to twist! I maintained an agnostic attitude about this period as it was occurring. It was never my favorite kind of music but there were some great songs behind the furor and it’s wonderful to see them getting their just due at last. I didn’t have the privilege of seeing any of it live back then, and from what I’ve heard of this so far, it is nothing less than a revelation. I don’t think anyone can say, no less know, what someone else believes in their bones and I was never troubled by Dylan’s exploration into this kind of music and his stamping his indelible mark on it. I accepted these song’s as, at a minimum, a fascinating intellectual foray on Dylan’s part. I have heard others’ versions of “Christian Rock” and given Dylan’s nimbleness of thought and expression, it’s fair to surmise (though not necessarily correct) that many others were more in earnest in their underlying, core beliefs. Dylan’s greater and burning intensity is almost confounding to listen to. Of course, he has always and often borrowed or covered other songwriter’s works, but rarely did he so completely sublimate his own voice to the strictures of a chosen genre. It is strange to hear Dylan sing so openly about universal themes and collective experiences, as if in this context he was an everyman. Yet his singular voice (distinct and apart from his singing style) comes through and endures. The “problem” in The Bootleg Series is Dylan’s astounding prolificacy; there isn’t enough time our of mind to give each release due consideration. And all the while, The Neverending Tour, Triplicate, Connor McPhersons’s Girl From the North Country. . . . . How was all of this ever possible? Outside of The Basement Tapes, this- his Christian era music- was the Bootleg Series i was more looking forward to. Given how undervalued, or dismissive Dylan aficionados have been of this period, it was a pleasant surprise to learn of it’s release without too long a wait from the Basement Tapes official bootleg from two years ago. I bought the vinyl 2LP version but definitely have my eye on the deluxe 8CD box when the prices fall a bit. But I agree- why leave the sermons out. Some of these shows had his female vocalists take individual turns on stage first, before Dylan came on- why leave that out, or at least not include a flavour of it, with a song or two. Finally why price the deluxe set so high? It is priced Â£150.00 here in the UK (about US $190.00) which is daylight robbery!